I’m searching for “user-friendly” java graph frameworks for an application that I’m developing for my studies. I stumbled upon JUNG. 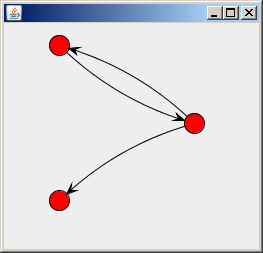 After 15 minutes searching and reading, I managed to create a directed graph and show it on screen. Next step: Try to show labels and try to change the vertex shapes. Of course, all libraries are imported. Do you know what should i do to fix it ? Hi Lucas. Just ran the program again and all seems to work correctly. Did you do any changes to the file? It’s been a long time since I worked on this. could you help please ?